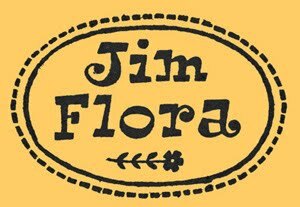 We recently opened a Jim Flora store at Etsy.com. For now, the shelves are merchandise-sparse, but more items will be added in the coming weeks. Current and future Etsy offerings are also available through our fine art prints gallery and our Little Shop of Flora's. Either place you purchase, the source is the same: us. We're also considering listing some exclusive items at Etsy. We'll have Flora 2011 letterpress calendars available in September. Same designs as 2010, and possibly some new ones, all produced by Yee-Haw Industries of Knoxville. 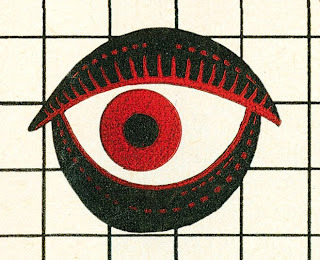 The above profile of Flora appeared in The Complete Guide to Cartooning (Grosset & Dunlap, 1950), by Gene Byrnes. 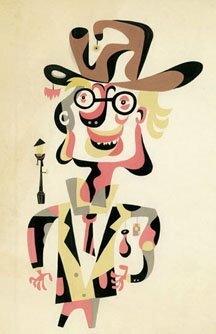 Byrnes had a long, distinguished career as a syndicated cartoonist (Reg'lar Fellers) from 1915 to 1949. 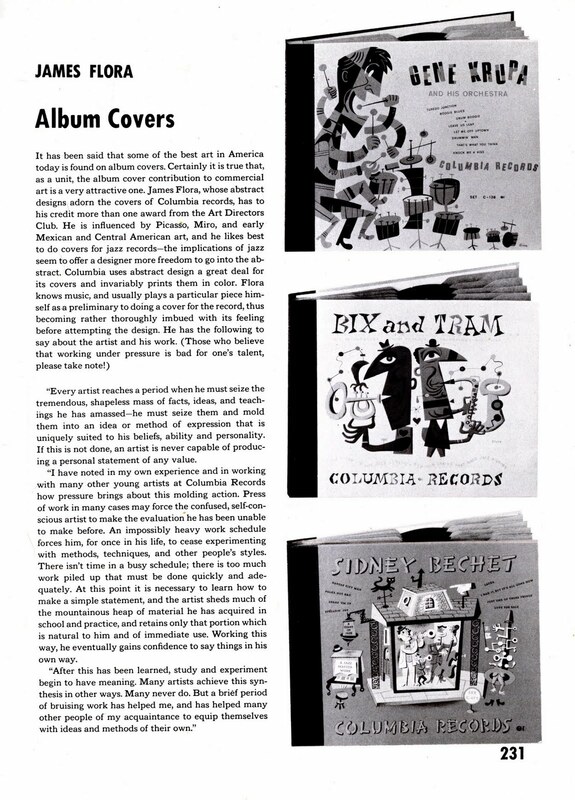 Flora never claimed to be a cartoonist per se, tho his commercial illustrations—in particular the 1940s Columbia album covers featured in the profile—certainly were cartoonish. In his quotes (click the image for enlarged reading), Flora doesn't address any aspect of cartooning; he offers an artistic credo vis-a-vis the demanding world of commercial art. 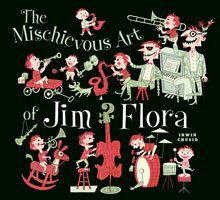 Ironically, by the time this book hit store shelves, Flora had bailed from his executive perch at Columbia and was en route to Mexico with his family to spend 15 blissful months creating art without commercial pressure. We learned the phrase "physical inventory risk" last week from someone in the music business. It describes why, in the current industry-wide economic downturn, many record labels won't gamble on artistically worthy but commercially uncertain projects: because of the probability ("risk") they'll end up with unsold goods ("physical inventory," e.g., CDs) sitting on distributor and retailer shelves. Rather than commit (again, "risk") financial resources to marginal productions, they trim existing catalog and/or keep the release schedule lean. While this is a regrettable state of affairs for niche markets and the artistically adventurous, from a business standpoint, it's understandable and fiscally prudent. 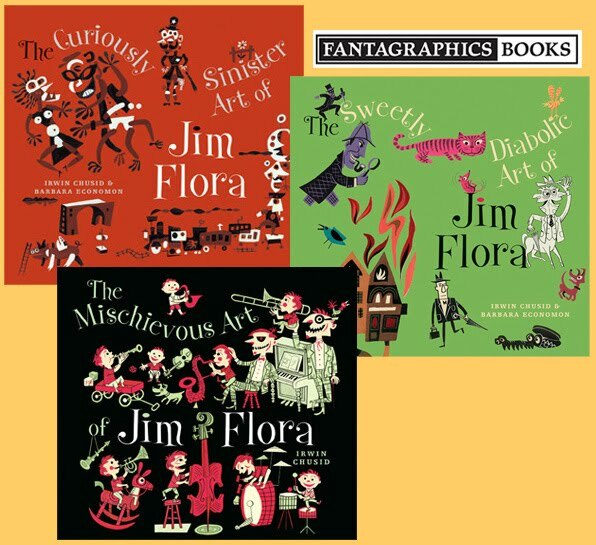 We bring this up because Fantagraphics Books, publisher of our three Flora anthologies (The Mischievous Art, 2004; The Curiously Sinister Art, 2007; and The Sweetly Diabolic Art, 2009), recently informed us that stock is low on the first two books and they will not be reprinted. This is a situation over which we, as authors, have no control. The economics of publishing make reprints of limited-market titles prohibitive. 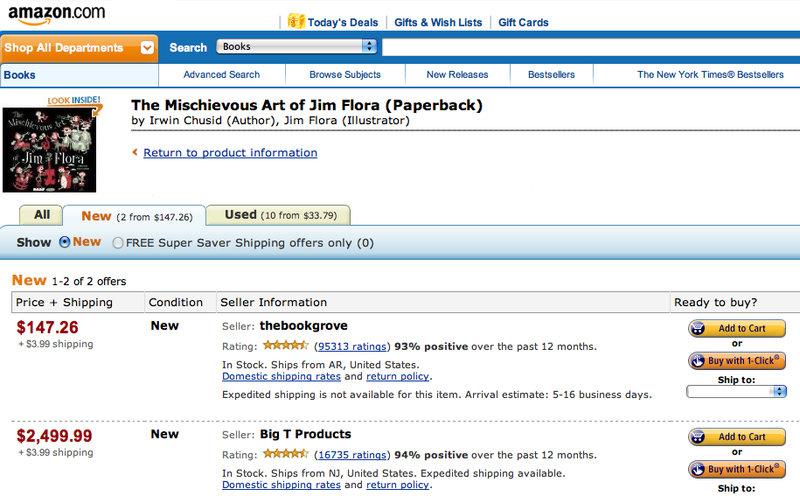 You may think Flora is a world-renowned artist whose legacy is commercially indisputable. (If so, we agree.) 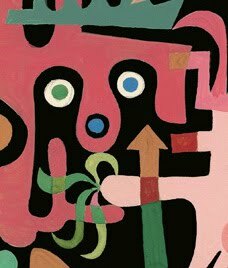 But to the broader public, Flora remains largely unknown, a cult figure. 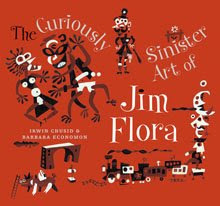 As of this writing, new and used copies of Curiously Sinister are still available at reasonable prices. Mischievous is becoming scarce and prices are trending upwards. New copies of our most recent book, Sweetly Diabolic, remain in stock. 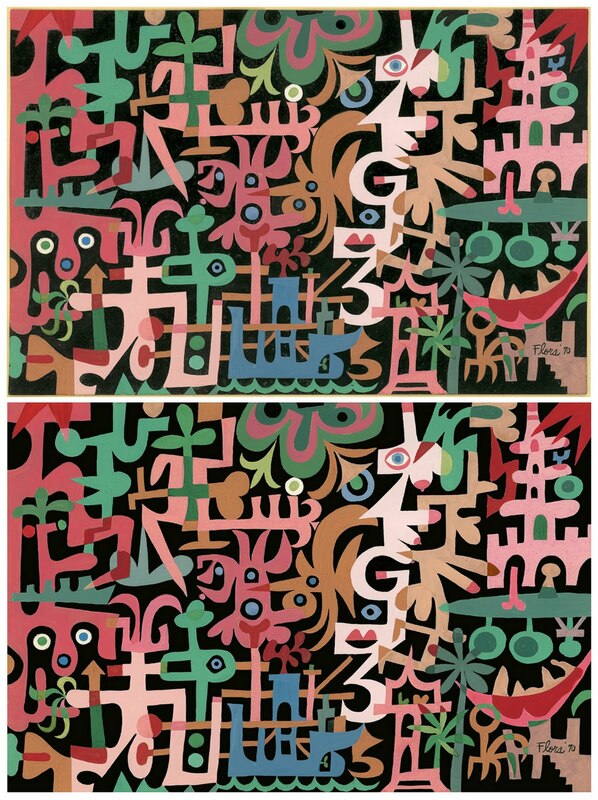 We launched our latest Jim Flora fine art print, G3 in Tampico (detail, left), earlier this week. 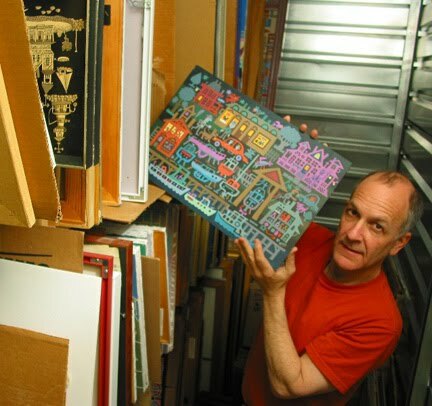 The original 1970 tempera painting on artist board is shelved in storage at the Flora collection in Norwalk, Connecticut. The title is an enigma, but so are the figures (full work below). Here's a peek at the selection and restoration process behind our fine art prints. The Flora catalog is huge; as co-archivists, Barb Economon and I have a growing list of works flagged for print production. G3 was not on this list. Most original works on paper have been scanned at high resolution, and oversized canvases have been photographed. The digital files then undergo a carpal-straining restoration process to prepare the images for print media (e.g., books, paper goods, fine art prints). This process is the purview of Barb, a specialist in digital image technology. It's become obvious during our research in the collection that Flora was less than fastidious in the preservation of his past art during his lifetime. It's likely that the large volume of historical works balanced against the ongoing creation of new works left little time for the artist to focus on safeguarding his legacy. Sunlight, humidity, careless shelving, aging, and accidents, as well as adhesive stains, paper acidity, and nicotine smoke have all taken their toll. After Flora's death, his family placed the entire collection in safe, climate-controlled storage (photo, lower left), where most of it remains to this day. The greater the deterioration of (or damage to) the original, the more restoration work is required. A few weeks ago a small record label requested an image to license for a CD cover. Reviewing hundreds of digital files, I discovered G3 (previously unpublished and uncirculated) and sent the label a low-resolution jpg (along with a batch of additional images). On closer examination, I realized the image had not been restored. Strictly as a Zen exercise, I undertook some rudimentary cleanup over several days, and the figures began to percolate. I reached the limits of my restorative powers and turned the file over to Barb. She made additional corrections and adjustments, and decided to produce a test print. It was declared a masterwork, and we decided to issue an edition. The entire process from idle cleanup to print launch took four days. Below is a before/after comparison of the images (click to enlarge). The original is in bad shape — there are faded areas, soiling, paint loss, and moisture spots. It's amazing what you can accomplish with painstaking mouse-clicks. I considered purchasing G3 from the Flora family. However, considering the condition of the original, I opted for a print. The damaged work would be expensive to restore, and without professional restoration it will continue to deteriorate. (Its condition is effectively stabilized in limited light, climate-controlled storage.) The new print reflects the work much as Flora created it forty years ago, with a few minor aging artifacts. Our newest Flora fine art print, G3 in Tampico, is available at JimFlora.com. 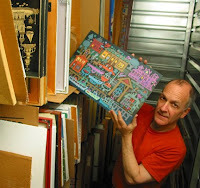 The 1970 tempera (on board), titled by the artist in pencil on the reverse, sits in storage, previously unseen. The work had not previously been published or reproduced anywhere. 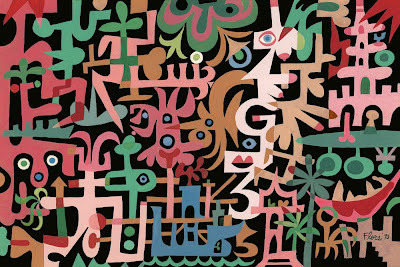 Tampico is the main city in the Mexican state of Tamaulipas (and the birthplace of legendary Space Age Pop maestro Esquivel); however, the significance of the Flora title (the "G" and "3" elements notwithstanding) is unknown. 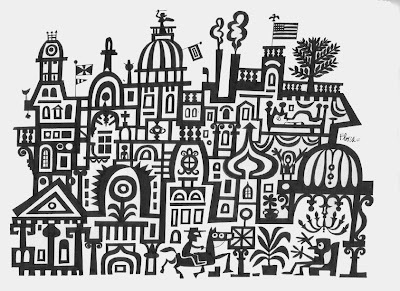 Peepers, towers, foliage, phallic imagery, and teats: G3-rated for moderate ambiguity. Edition of 25. 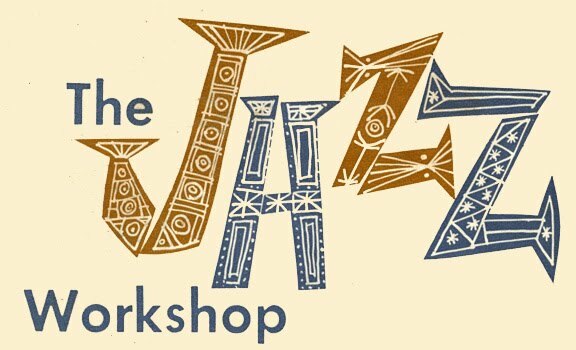 In each case, the album covers are photographic, the "Jazz Workshop" logo branded in a corner. 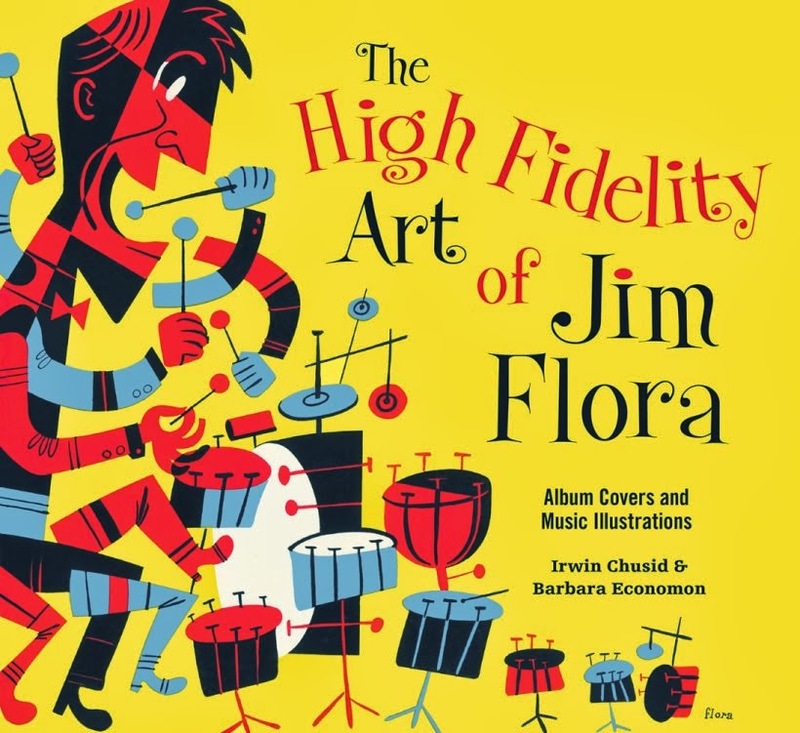 There's no typographical credit, yet the intricate lettering appears to be the handiwork of Flora, who often toyed with typography and illustrated dozens of RCA Victor (front and back) covers between 1954 and 1961. The letter fills reflect Flora's painstaking mischief. One Floraphile insists on the benefit of the doubt. That would be me. Until proven wrong, I remain insistent. 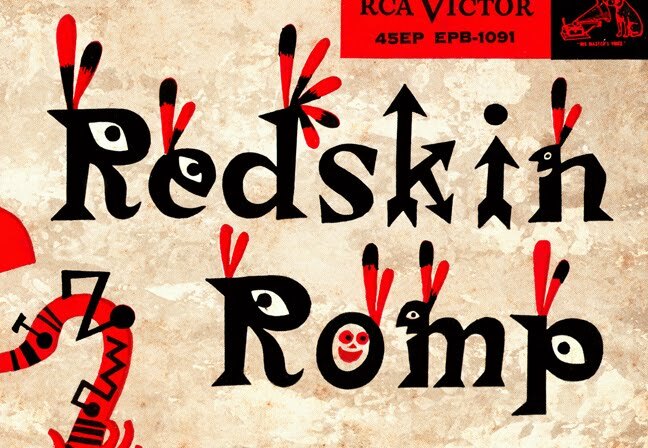 Hand-lettered typography from cover of Charlie Barnet's 1955 compilation Redskin Romp 7" EP (also released as a 12" LP). Barnet (1913-1991) was a Swing Era bandleader and saxophonist whose first 78 rpm hit, "Cherokee," released in 1939, inspired the Indian-themed title of this 33-1/3 rpm hi-fi retrospective. 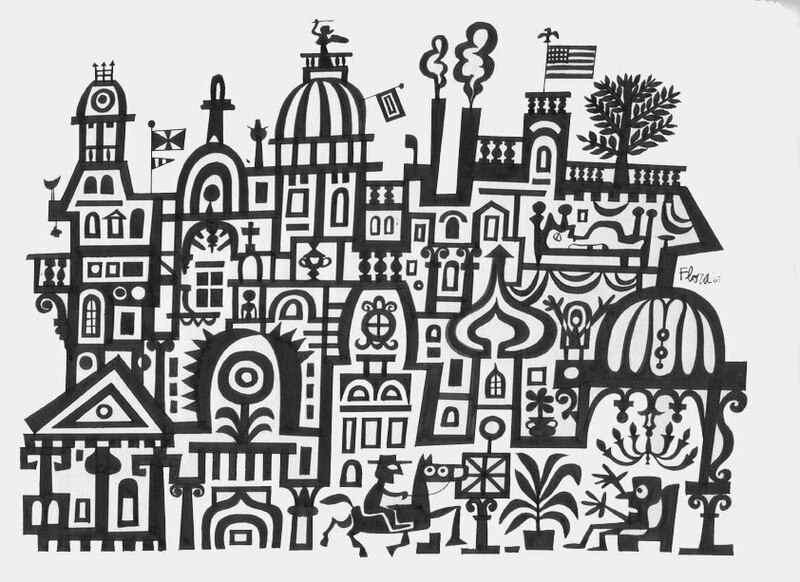 Above is a section of the full cover; that's a non-lookalike caricature of Barnet in the lower left. Detail, cover illustration, "Human Engineering: Tailoring the Machine to the Man," Research and Engineering magazine, February 1956. We reproduced the entire illustration here. Pure blacks are missing from the detail, an enlargement of a scan of a worn cover. 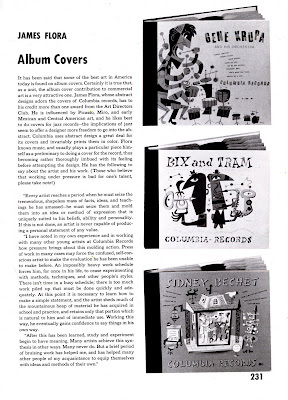 Copies of R&E in any condition are difficult to find, and the original art has not been located. 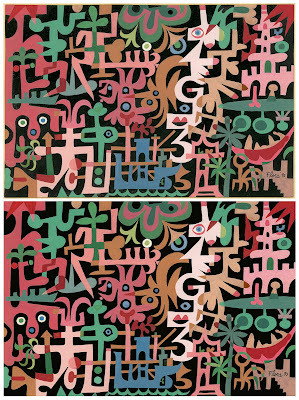 Untitled Mexican motif, pen and ink (or tempera) on paper, 1967. 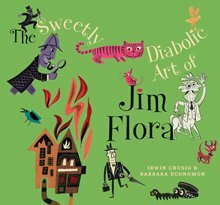 The work was reproduced in our most recent book, The Sweetly Diabolic Art of Jim Flora.